Great quality, true to picture. Enjoy the quintessential boyish style with the Bricky road trip coverlet set from Taylor & Olive. Featuring prints of cars, buses, and campers in blue and green hues, this design puts a modern spin on a classic look. This coverlet set is so cute! While it is marketed for kids, I purchased for the camper I am purchasing. The colors are great, the coverlet set is well made and the little pillow is very charming. It has a dimensional feel with the looped threads creating the travel van motif! I'm very glad I ordered this set! Bought this coverlet for the top bunk of our son's bed set and the complimentary duvet for the bottom. 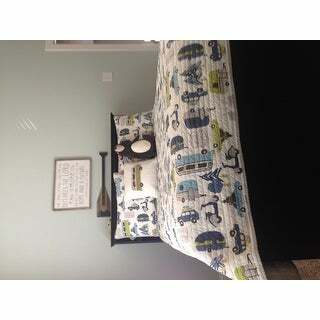 The print and colors are adorable and the matching pillow make either set a great value. We love both! This a very high quality set. My 3 year old loves quilts so we wanted to get him one for his new big boy bed. The colors in the Road Trip set are great for a little boy and the cars/ trailers design is awesome. I am very satisfied with and my son loves his bed. I expected 2 pillow shams but only got one. Re-reading the description, I see that only one comes with the twin set but the description should be MUCH more clear in this regard. Love this quilt set, the colors are very calm and still boyish and fun but no bright crazy colors. The quilt seems very high quality and it was a nice surprise that it included a cute throw pillow. Hope to have this set for my son for many years to come. Only washed once so far, but washed great!! And it's very soft! This is a beautiful and well made bedding set. However, be mindful that it is not for a full size bed but a queen size. I purchased it for my kiddo’s twin over full bunk bed and it draped to the ground on every side. Who did this for my son’s first big boy bed. The colors are true to the pictures on the website. I’m so happy l chose the coverlet over a comforter for his bed. l will keep this brand in mind for future orders. Also my order was delivered quickly and when it said it would arrive. very cute design and great quality. it's just what i was looking for. most other car themed sheets/quilts did not fit my tastes b/c of loud colors and cheap looking designs, but this one is really nice. 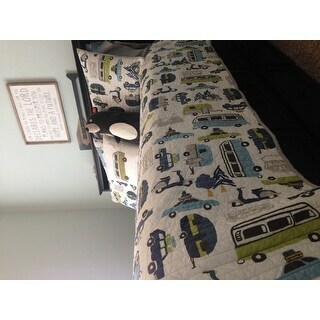 This is my favorife bedding set that I have ever purchased for my kids. Washes well and is nice lighter weight cotton comforter. BONUS: fits in the washing machine! I love this cotton quilt, perfect for spring / summer. The patterns and colors very nice, I got this for my 7 year old son, and he loves it ! My son loves it it's reminds me of an old fashioned quilt. Nice and heavy but it still has that cool feeling to it that you want in a quilt I was even thinking of getting one for myself! This is the most adorable quilt ever. My daughter is incredibly happy with it. We love it. I would definately order again. The colors are very vibrant and the quilt is well made. Adorable, and very well made! Unique, nice colors for my little boys adventure themed bedroom! Quilt washes nicely, and is a nice weight. Great vintage pattern! Very great quality and super soft. It’s exactly as pictured. Washes great and fits bed well. Would definitelyrecommend to anyone. Perfect for little boys room! Excellent quality! Looks awesome on my camper!! !